Having spent the opening week attempting to stay out of trouble by keeping safe amongst the peloton, Stage 9 should see the first serious exchanges amongst the riders vying for the maglia rosa. 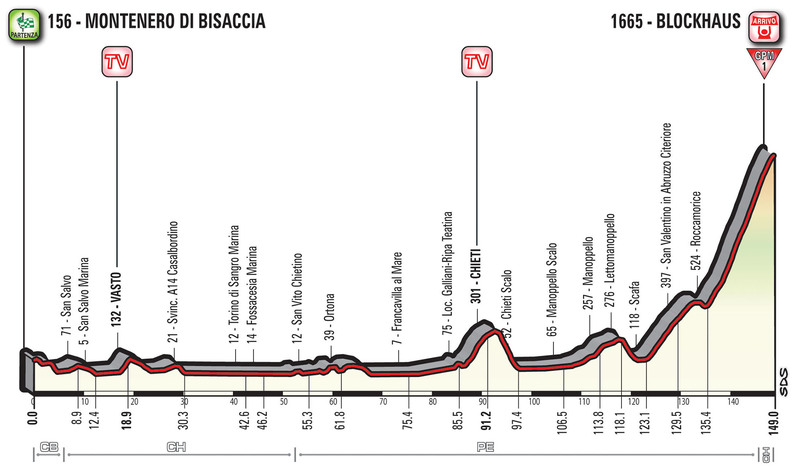 A 149km passage from Montenero Di Bisaccia to the summit of the mighty Category 1 ascent of Blockhaus is likely to prove an intense uphill battle on such a short stage. The topography is relatively tame ahead of the blockbuster finale, with the rise at Chieti the most noticeable feature between the departure and the base of Blockhaus. The road begins to point skywards with around 30km remaining, though the officially recognised start of Blockhaus does not begin until the riders are 13.6km from the finish line. With an average gradient of 8.4% and maximum slopes of 14%, it is a truly testing climb, but it generally avoids fluctuating too greatly and should allow the elite riders to find their rhythm to the top. Nairo Quintana is the favourite of many pundits to take the overall title this year and it shall be intriguing to see how himself (and Movistar) choose to ride this first serious mountain clash. Expectations are that he will not lead the charge to begin with, preferring to allow his rivals to initiate the opening salvos of attacks, but shall be ready to close the gaps and counter in aggressive fashion if required. His ambitions to achieve a Giro d’Italia and Le Tour de France double this year has meant that he arrives at the former without his best form, aiming to ride himself into race winning shape by the final week. Ilnur Zakarin has been plagued by bad luck thus far, yet looked particularly dangerous to the general classification when making a late move on Stage 4 to recoup some of his lost time. Zakarin is one of the most aggressive climbing specialists here and will find the course suiting to his strengths, capable of seriously turning the screw upon the bigger name favourites. The Russian rider is clearly coming into great form, yet the expectation is that he may be allowed a degree of freedom, as many do not seem him as a serious threat for the maglia rosa at the end of the three weeks. Thibaut Pinot will be eager to turn in a strong performance on Stage 9, as the Frenchman seeks to overcome his tendency to choke on the first decisive stage of a grand tour. With the ascent of Blockhaus a sustained grind to the summit, Pinot is one of the obvious contenders for this specific climbs and has been riding strongly so far; often sprinting for the line alongside the likes of Geraint Thomas. Normally seen to roll over the line amongst the general classification names at grand tours, there is a sense that Pinot’s approach at 2017’s Giro d’Italia may become more attacking than previously seen. Steven Kruijswijk came close to wining this race last year and comes back to the Giro d’Italia wiser for his close brush with victory in 2016. The Dutchman has been on the floor during the opening week and also abandoned the Tour of Yorkshire early after having crashed relatively hard, leaving as a precautionary measure ahead of his appearance here. An incredibly strong rider, he may prefer a longer ascent than Blockhaus can provide, yet shall no doubt be able to follow all the necessary move. Geraint Thomas has proven to be extremely consistent in regards to staying in the right position at all the key moments in the first week of racing so far. The Welshman was incredibly strong during the Giro del Trentino and will need to be considered a serious challenger for the overall title if able to show he has retained the form having reached the top of Blockhaus. Like Pinot, Thomas has often been seen sprinting for the line when able to, displaying his eagerness to make every second count ahead of the race’s first venture into the mountains. Away from those who have their eyes set upon the general classification, dangerous riders on Stage 9 include: Vincenzo Nibali, Domenico Pozzovivo, Hugh Carthy, Omar Fraile, Mikel Landa and Adam Yates. Posted on May 13, 2017 by Spokenforks	This entry was posted in Giro d'Italia 2017, News and tagged Adam Yates, Blockhaus, Domenico Pozzovivo, Geraint Thomas, Giro, Giro d'Italia, Giro d'Italia 2017, Giro d'Italia 2017 Stage 9 Preview, Hugh Carthy, Ilnur Zakarin, Mikel Landa, Montenero Di Bisaccia, Nairo Quintana, Omar Fraile, Steven Kruijswijk, Thibaut Pinot, Vincenzo Nibali. Bookmark the permalink.